Wedding is an auspicious moment in anyone’s lives especially because two loving people are brought together in a relation of holiness and everlasting love. When the special day arrives each and every detail is brought to life so that bride and groom have their most memorable day of life. The wedding day is celebrated and a new life of two people starts. From bride walking down the aisle to getaway of bride and groom once pronounced man and wife are the best times of the marriage ceremony. As you do all the preparations for wedding, your get way should also be similarly decorated like these. One of the ways to show the world about your marriage and get adored is quite well known. 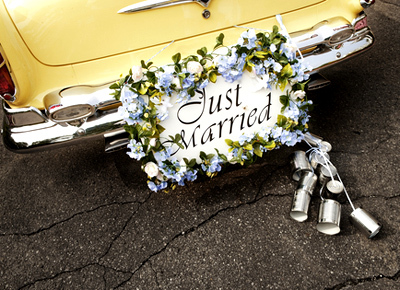 The paint or stickers (so can be removed later) is of just married, there are so many different writings and ways to do it but this one shows love in the air. Tulle brings sophistication and class whereas flowers are of course the most beautiful way to express hapines and festivity. This also depics that you have tied the knot with the most important part of your love. So get away in class beside love of your life. 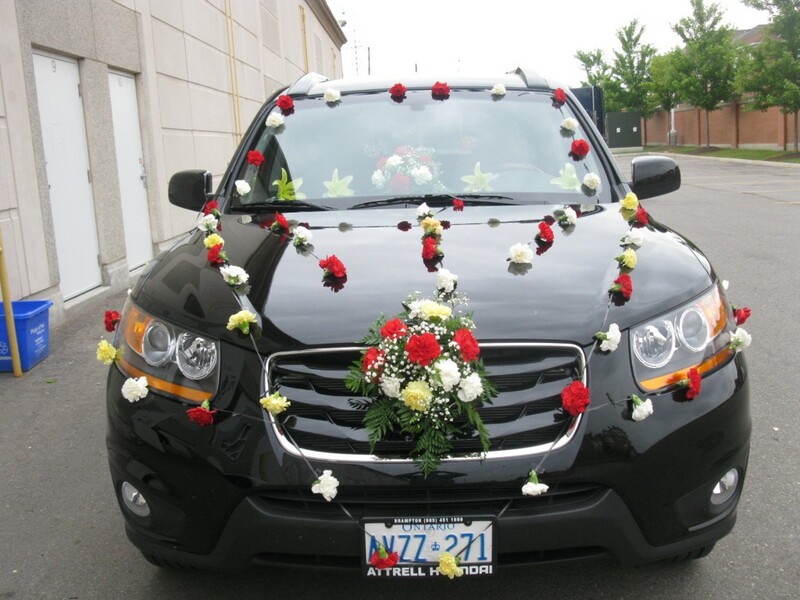 Flower bouquet and car front decorated with flowers in this way shows sophistication and beauty and also speaks for itself that you are “Just married” and on your way to perfect and beautiful life ahead. All those wedding cars always have pretty cans behind them but what if old tradition is revived with the zing and flare of pomp-pomp. Well bring out the happiness and enthusiasm of cheer leaders out while you are decorating your car for the perfect get away. For a day even cops wouldn’t mind if you replace your back number plate with your relationship plate. 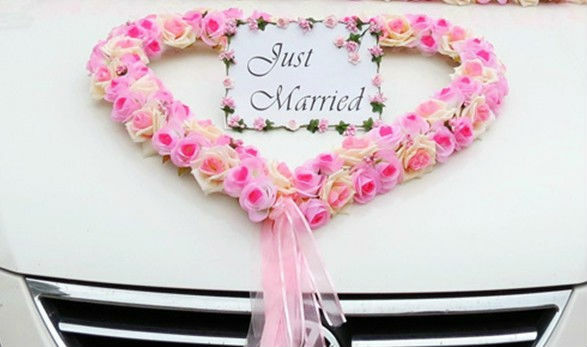 Show off to world that you just got married with this wreathed “Just married” car plate. Tulle is just perfect little addition to the decoration. It brings out the perfection of décor. 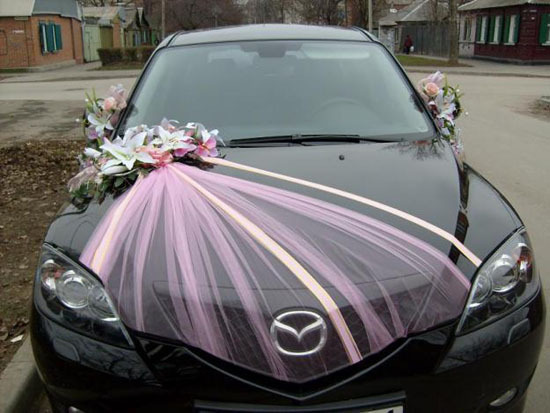 Choose tulle of your favorite color and use it in various ways in combination with the flowers. Make it a bow(as above) or may be use it as a statement maker with some ribbons refining it a little bit more. This is not only pretty but also brings ingrace. These decoration styles and many more can be discussed with your partner and whichever you think suits both of your personalities can be designed. 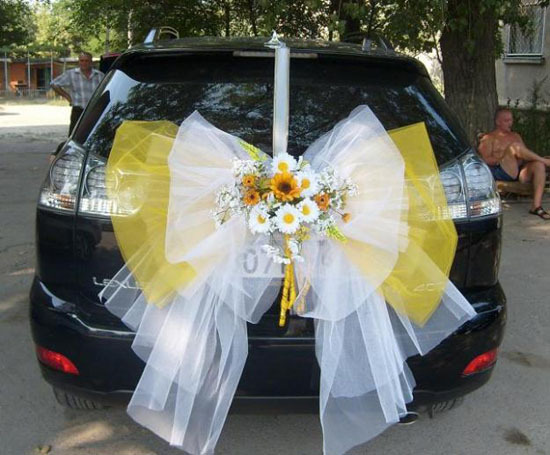 If the groom decorates it by himself it will show the effort you are putting to make your lady happy. And there is no way better to start a new colorful and loving journey of life with your everlasting love. 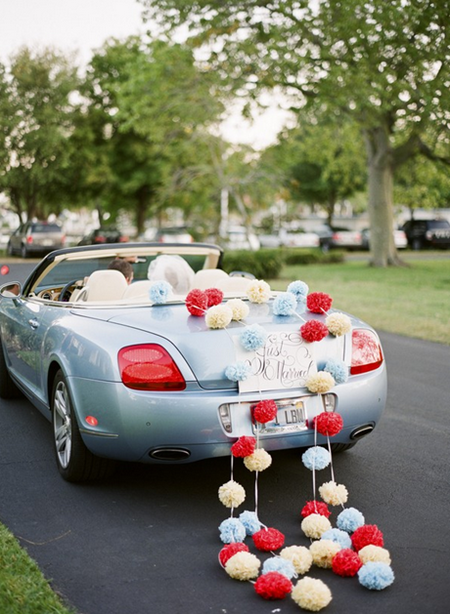 These designs are easy to DIY and just some of the décor ideas that you might want to consider for the wedding car. It’s time to make the choice and get on with decoration. Happy wedding!